Trust your gut. I wrote about this with Jude's recent SPD diagnosis but that is not the first time I pushed back on something I felt wasn't right. "Trust your gut" is one of those expressions you always hear and (if you're like me) often roll your eyes. It just seems so silly. But what it really means is you know your child better than anyone else in this world. A doctor sees them for 15 minutes at a time. A friend sees them once a week. You see them every single day. And from the time they were placed in your arms at the hospital, you have studied their cues so you can best support them and be their biggest advocate. This doesn't change as they get older. In fact, it gets easier because they've learned to communicate as well and together you are a pretty amazing team. Don't feel pressured to potty train. This has been one of my biggest parenting struggles. When the kids turned 2.5, we decided it was time they moved to undies. Did either one of them show signs they were ready? Absolutely not. We decided for them. And it worked... for Sloane. It took her exactly one day. We spent a solid two weeks with Jude and while he would use the potty when we took him, he never asked to go. I became a nervous wreck to leave the house or be away for more than 30 minutes. Their pediatrician told me potty training should not be that difficult and to try again later. We put Jude back in diapers for several months and then tried again. Same results. I'd always said my children would be potty trained by three (easy to say when you don't have kids) and their third birthday flew by with my boy still in diapers. We tried again when he was 3 years, 2 months and it was a completely different story. Of course he still had accidents at first - I'm not saying potty training will ever be easy (unless you have a potty savant like Sloane - ha) but it just clicked with him after a few days. He was ready. More good news: When he's filling out college applications, there isn't a line that asks, "How old were you when you potty trained?" If your child is like my son, just know it will happen. One day it will happen. So many people told me that and I had my doubts but guess what? It happened. You don't have to spend a fortune on Birthday and Christmas presents. This is something we have stuck to since the beginning. Regardless, thanks to family & friends there are still so many toys in our playroom that I have a borderline anxiety attack at least once a week. I felt a little guilty this year at Christmas when there were only a few toys under the tree, but my 3-year-olds were completely ecstatic to see what Santa brought. Not once did they ask for more or wonder why we'd only gotten them a few gifts. I think it's a good lesson for all of us that it's just stuff. And stuff is expensive and takes up a lot of room. Television is ok. It's even good. I will come clean and admit I was not always a follower of this. We didn't let our kids watch (or even face) a tv screen for their entire first year. I became a little more lenient around 15 months and have never looked back. Obviously there is a balance, but the shows they watch have taught them so much. They learned how to count and all of their shapes from Mickey Mouse. They learned the potty song and have some of the best manners I know thanks to Daniel Tiger. They've learned to be kind to their friends and share their toys. Could we have taught them all of these things without tv? Of course. But being a first time mom, I didn't even think it was possible for 2-year-olds to count to 20. I probably would've waited until the day before kindergarten and then decided, "Ok, they can probably handle this now." Another reason I'm so grateful for television is the repetitive nature. Jude is great at memorizing songs & phrases and it's given him more confidence with speaking. He will recite an entire speech from Paw Patrol and in my head I'm thinking, "You just said 37 words in a row!" And you know what? Sometimes they don't learn a darn thing but it's 30 minutes when you can sit and drink your coffee and completely zone out. That's ok too. Keep a (somewhat) tidy space. This makes me sound like a 1950s housewife, but I can't tell you how much happier I am when there isn't junk everywhere. My friend once told me, "If it takes you less than five minutes to do, do it right then." It's such great advice. I breathe easier when I look in our living room and can see the floor. That being said, one of the biggest rules in our house is we clean up our own messes. Before bedtime the kids help pick up the playroom. If they spill milk, we give them a paper towel to clean it up. Sometimes it's excruciating because what would take me 12 seconds to clean up takes a good five minutes from my turtle toddlers, but they're learning an important lesson. Your children are your priority... and no one else's. This is a bit harsh but I think it's something we need to accept. It doesn't stop me from posting too many pictures and videos of my kids but it also means when my kids are talking loudly in a public place, the rest of the world doesn't find it nearly as cute as I do. I think it's just something to remember when you may feel slighted by an acquaintance or overly dependent on a friend. It doesn't mean they don't love your child or have their best interest at heart, it just means they probably don't need to hear the 15-minute version of your child's bowel movement. Don't give up everything you love - find what makes you thrive. I actually wrote a blog post about this once but I think it's worth mentioning again. In the beginning, you're pretty much forced to give up everything, which is (most likely) just fine because you wouldn't want to be anywhere else. However, there comes a time when you are not physically and mentally 100% attached to your child and when that time comes, it's healthy for you to remember what you loved before kids. 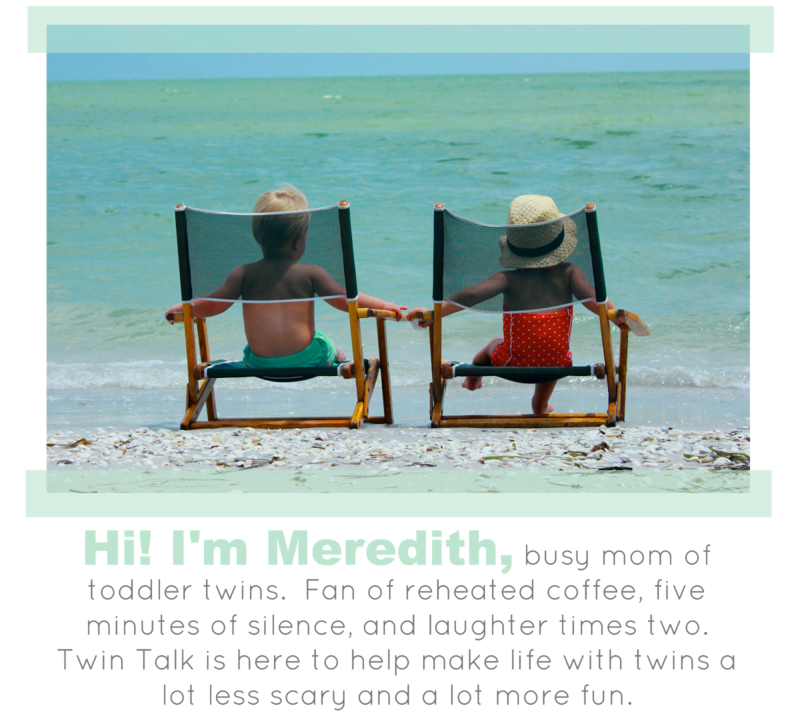 For me, I missed writing so I started Twin Talk. For others it's the gym. (You bunch of weirdos. Just kidding.) Just don't lose yourself in your kids. Be the same person outside of your home as you are inside. I grew up in a very normal family. We were far from perfect, but there was a lot of love and amazing memories. I respected my parents and they respected me. Because of this, I also trusted them completely. One of the best takeaways from my childhood experience is that what I saw in our home - the way they talked to us and treated each other - was the exact same as what I saw in public. It made the world far less confusing and is something I try to think about on a daily basis. Now let's be honest with ourselves. There are times when my patience is thin and I throw a mini fit inside our home - probably not going to do that in public (you're welcome, world). But it's so important you aren't throwing mixed signals your kids way. Make mom friends and make them a priority. This seems so obvious, but it is absolutely crucial. I couldn't do this mom gig alone. And I'm not slighting Michael in any way, because he hears every story I share with my mom friends. But there is something about hearing a fellow mom tell you, "My kid does it too." Or "That sounds like a terrible day, I'm so sorry." And here's the biggest takeaway from this: Any mom friend can sympathize. Or empathize. Find a mom friend who can also celebrate with you. Find one who is genuinely excited when you or your child does something well. It seems so easy, but when you find that friend or friends, hold onto them tightly because it truly is a gift when you feel comfortable sharing the bad and the good.